According to Sloane's Column (2/8/1958), a pane of 50 stamps was found at the post office in Cleveland, Ohio. 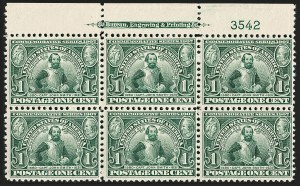 The stamp was issued on April 30, 1904, and the error was found within six weeks of issue. The pane was sold by a "girl" at the window of Station B to A. W. Weigel, whom Sloane describes as a "postal carrier" who also had philatelic knowledge. In fact, Weigel operated the Ohio Stamp Company and was secretary-treasurer of the Garfield-Perry Stamp Club. The error pane was purchased shortly after Weigel's fortuitous post office find by famed collector George H. Worthington of Cleveland, reportedly for $100. Worthington held the pane until 1917, when his collection was sold by J. C. Morgenthau & Co. The pane had been divided prior to the sale, to allow multiple collectors to obtain an example of the variety. 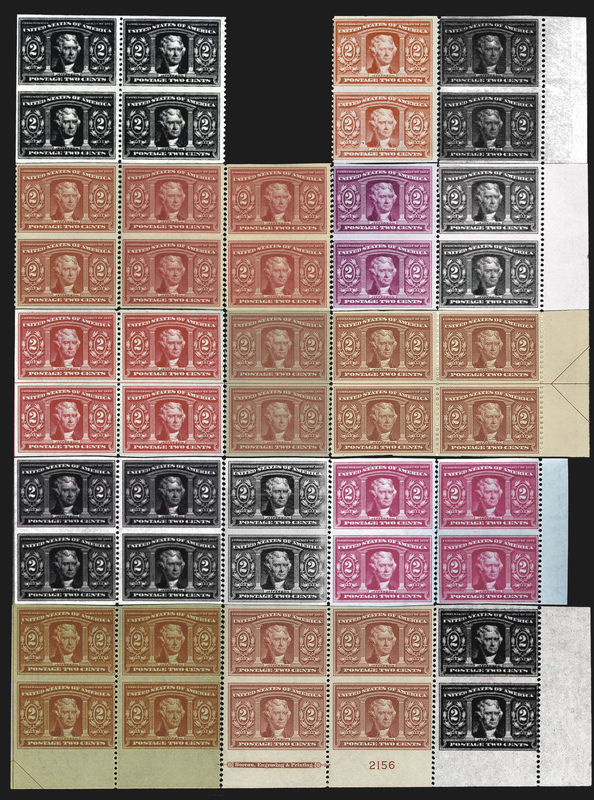 In the Worthington auction, 26 of the 50 stamps were offered; the remaining 24 stamps were sold privately. Sloane and other writers have always stated that top and bottom plate blocks exist, presumably based on the layout of the plate, not on any personal encounter with both plate blocks. However, the top plate block has never been seen, and for good reason--it does not exist. We have been able to painstakingly reconstruct the pane, except for one pair. As the reconstruction shows, the top plate block can no longer exist, because the top sheet selvage with the imprint was trimmed off. 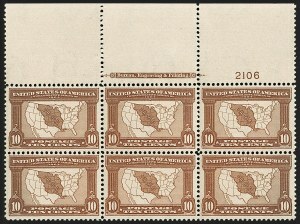 As for the left half of the error sheet, it has been written that the female postal clerk remembered selling it, but it is more likely that it was never released or was fully perforated. We base our theory on the perforating method. The sheets of 100 were perforated in two steps. 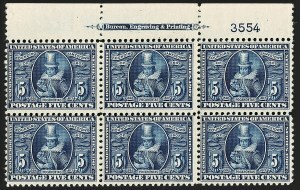 First, the vertical rows of perforations were applied with the perforating wheels set at the correct width for the wider horizontal dimensions of the stamp. A cutting blade replaced the wheel of pins at the center of the sheet, so that the act of perforating the sheet along the vertical axis resulted in the division of the sheet into two panes (each with a straight edge along the guide line). 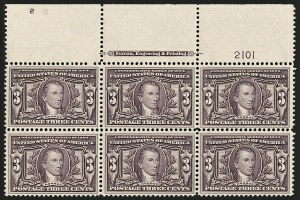 Second, each pane of 50 was perforated in the horizontal direction, using a different setting for the narrower height of the stamp design. 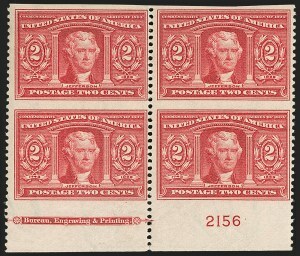 Therefore, while it is possible that both panes were left imperforate horizontally, it is more likely that one pane was fully perforated and the other (the right half) was not. Another possibility is that one or both panes were marked as defective by the Bureau of Engraving and Printing examiner, but only one was removed from distribution. This scenario might explain why the top selvage was trimmed off the error pane sold in Cleveland. Perhaps the discoverer, A. W. Weigel, a knowledgeable philatelist, did not want to give postal officials any justification for reclaiming the sheet, so he trimmed off the top margin with the examiner's mark. Digital reconstruction of the error pane of 50, showing the plate block at bottom and all but one pair. The block and two pairs from the top of the pane are evidence that the margin was trimmed off, which means there can only be one plate block. The left pane was either fully perforated or destroyed. Note: the different shades are the result of varying images and do not accurately reflect the items’ color. 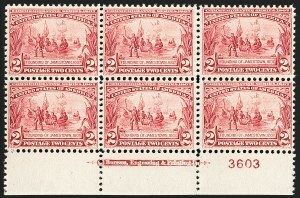 Top position plate blocks of the 10¢ Louisiana Purchase Issue are very difficult to obtain, especially in Mint N.H. condition and with wide selvage. A Power Search review indicates the last we offered was in 2012, but the perfs on that block touch the design. Our 2007 "Saddleback" auction contained one, but its perfs almost touch the design. One has to go back to our 2002 Drucker sale to find a plate block comparable in quality to the one offered here.